On Tuesday 11 December, Cumbria Alcohol and Drugs Advisory Service (CADAS) are holding their first ever Charity Bake Off. Competition is bound to be tough as we know that we’ve got some wonderful bakers among our supporters but don’t let that put you off. We’ve got three categories – professional, amateur and under-18 – and it only costs £5 to enter. 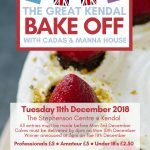 Prizes include a signed picture of Noel Fielding, a stand mixer, decorative bowls by La Maison, a masterclass at Kendal college and a personalised star baker apron. Please note that cakes need to be delivered to Manna House by Monday 10 December.